Tom got shot for his birthday! "What was your favorite place?" "Is there any place you would relocate to?" "Kids, would you do it again if you could?" A. YES! In a heartbeat! That about sums it up. We have officially altered our children's lives forever. Cruising may fade into the background for a little while, as they blend into their world of teenagers. But, we believe, it will resurface to help them navigate through their own journeys. Our global sailing cruise may be over for now, but we'll continue to enjoy the bliss of coastal cruising for a few years, before we take off again when the kids reach university. As we reflect and recount our trip for family, friends and strangers, we simply say, "It was GREAT! Literally, all of it. Every single bit of it." The four of us are most grateful to the innumerable locals who welcomed us, the cruising friends who are now family, the cultures that awed us and our land friends who never, ever lost touch and celebrated our adventure. Tom has been banging away on that laptop, mostly financial data, industry research and statistical analysis, but he took some time out to reflect on his favorite pastime. Cruising. Take a peek at his article in this month's "Bluewater Sailing/Multihulls Quarterly". Click below on "Multihulls Quarterly: Zen's Den". Multihulls Quarterly: Zens DenView more documents from Burgess Media LLC. "Be on the ship at 7:00am Easter morning", says Patrick, the loading master for Dockwise Yacht Transport. Valentines in Auckland and Easter in Ft. Lauderdale. Do you think they get a discount at the commercial docks for holiday berthings? Nonetheless, our Easter was spent first in a cab, then on a huge ship, and finally aboard our floating home, s/v Zen. She was dirty, had a pile of shrinkwrap (that's Tom in the picture above with the wrap on the tramp), plenty of residue glue, a couple of projects to attend to and small dots of stains on the nonskid thanks to the exhaust coming from Super Servant 3's stacks. But, all was easily fixed with a little elbow grease. Cammi and Cole were in charge of many jobs, and I was quickly reminded of how a sailboat naturally bonds our family. Working as a team, the day went by quickly. 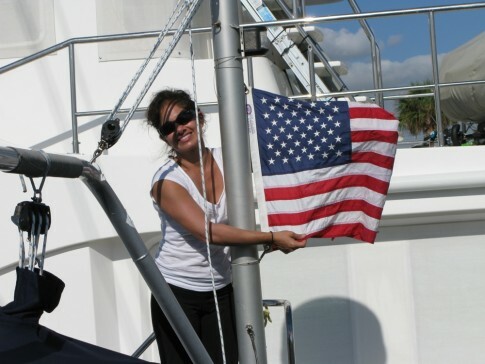 By late afternoon, we were chatting with our neighbors at the Ft Lauderdale marina and were immediately reminded of the yachtie persona: friendly, helpful and quick to smile. Twelve hours after our pre-sunrise cab ride, we were sweaty, smelly and ready for some serious food. No, it wasn't my mom's, grandmother's, or aunt's amazing 5-hour holiday meal, but it sure fit the bill. The popular restaurant, called Anthony's Coal Oven Pizza, immediately found us a table instead of giving the standard response of, "Sure, table for 4, that will be about an hour's wait." Normally, we are surrounded by tons of extended family, egg hunts and fancily clad kids and adults. This time we could not have been further from that scene. It was tank tops and strangers, but two things were consistent, the warm reception and the perfectly cooked delicious food. Our megayacht neighbors suggested the joint and nailed it. Our table of four was happy, thrilled with the work accomplished, and content with the Easter celebration. The week in Ft Lauderdale will be even shorter than a week. And the cruising we had hoped to squeeze in from April through June in the Bahamas is out. Team Burgess, always changing with the wind, is being promptly sucked into the 'real world', mostly due to Tom's new company that is way more than off the ground. Although 2 more months of cruising is quite enticing, when reality and opportunity calls, we are more than rejuvenated to listen. Zen will see us again in May or June, when a nice weather window opens, and we'll sail her straight up to Newport, where she'll enjoy being back at the ever-friendly, Newport Shipyard. We are sore, tan, and counting down the days until we say adieu to our beloved blue boat. Our sincere thanks goes out to the crews of Dockwise Super Servant 3, s/y Nelson, and s/y Isabelle, for helping to bring Zen safely through 55 knots of wind and huge waves. We are so happy to have her in back in the US of A!! Tom, Monique, Cammi, and Cole. Tom is the CEO/Founder for a high-tech advertising firm, which he just sold to a large US media company, giving us the ability to set sail. [...] Monique was also in high-tech, but now does remote office management for her brother's financial management firm and is a full time mom. Cameron loves classical ballet, piano and all things "dance". Cole enjoys karate, soccer and music.